SAGE strives to be the leading independent, academic and professional publisher and we are delighted when both, our publishing efforts and those of our talented author and society base, are recognised. 22 January 2016: SAGE is proud to announce that Mr Vivek Mehra, MD and CEO of SAGE India has been conferred with Sharda Top Rankers Excellence Award for “Visionary Leadership" at the 17th National Management Summit in a ceremony held in New Delhi. The Top Rankers Excellence Awards recognize top performing individuals and organizations across India. Nominations are judged by recognizable leaders within industries, academicians and editors with business experience. It is the first time that someone from a publishing house has bagged this prestigious award since its inception. This reiterates and recognizes SAGE’s contribution towards innovation, dissemination and leadership. 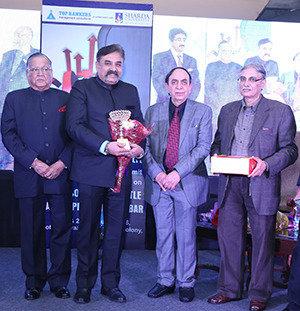 Mr Vivek Mehra received the award from Lt Gen K M Seth, former Governor of Chattisgarh, Mr V S K Sood, Managing Director, Top Rankers Management Consultants and Dr Mukesh Chaturvedi, Dean and Professor, Sharda University. 11 October 2013: SAGE India flagship journal Science, Technology and Society has been honoured with 'Charles et Monique Moraze Award' by the French Social Sciences Foundation (Fondation maison des sciences de l'homme). The award is granted in recognition of the innovative work conducted by the publication since its inception, in one of the two fields of research dear to Charles Moraze: science and society, and education and society. The first laureate of the prize is being awarded to the journal Science, Technology and Society. Launched in New Delhi in 1996 with the support of FMSH by an Indo- French team led by Professor V.V. Krishna, from Jawaharlal Nehru University and Dr Roland Waast, from the French Institute for Research on Development, as the first truly international journal in its field devoted to the developing world and published-by SAGE India- from the region. Speaking at the occasion, the editor of the journal Prof V V Krishna said “The award is being given to our journal for the professionalization of the field of science and society studies in the last two decades. Without the help, commitment and dedication of colleagues at SAGE, particularly editors and other colleagues connected with the publication of the journal, this recognition would not have been possible at all. I would like to express my sense of gratitude to each one of our colleagues there connected with this journal. Above all, the journal witnessed remarkable academic progress over the years which led to its ranking in the SSCI of Thomson Reuters”. Professor Krishna is presently the chairman of the Centre for Science Policy, Jawaharlal Nehru University. The Award ceremony was held in Paris in Fall 2013, in a year celebrating the Fiftieth anniversary of the creation of the Fondation maison des sciences de l’homme (French Social Sciences Foundation). Reacting to the news, Mr Vivek Mehra, MD &CEO, SAGE India said “SAGE India has always believed in encouraging Innovative ideas. This award is a testament to our continuing commitment to quality publishing. We are proud to be associated with the journal and would like to congratulate every member associated with the journal for this well-deserved award”. The award to the journal also provides Prof Krishna with the opportunity to be Visiting Professor Chair for 2 months in Paris. During this tenure he would be working on a collaborative project with colleagues and prepare a lecture on 'Changing Social Relations between Science and Society - Contemporary Challenges'. As the education and research landscapes rapidly evolve, it is paramount that we work closely with our partners, understanding and responding to their needs. Sponsorships provided by SAGE contributes to an ideal environment for open discussion between both publishers and our scholarly community in order to ensure that we work together on this shared goal of supporting education and dissemination. Rob Potter Award Instituted for the Best Journal Article! 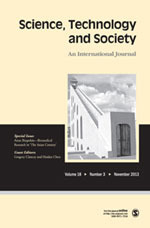 The leading independent academic publisher, SAGE in 2015 instituted the “Rob Potter—Best Article Award” to honour the memory of Professor Rob Potter, for the most noteworthy article featured in the journal Progress in Development Studies. Prof Rob Potter, a distinguished academic expert on urban geography and the geographies of development was the founding Editor-in-Chief of Progress in Development Studies, a flagship journal of SAGE. His contributions in the field are unparalleled to any. Although the award was instituted recently it has since then become very popular with academia. This is prevalent from the number of submissions received. The winning article "Trust and the wealth of nations" by Prof Nurullah Gur, Istanbul Medipol University, School of Business and Management Sciences, Beykoz, Istanbul, Turkey has been awarded a cash prize of $200 and the article was published in the April 2015 issue (Volume 15, Issue 2.). The list of other nominated articles has been included in the October issue of the journal (Volume 15, Issue 4). The editorial board of the journal nominates 10 articles from the articles published in the current year issue of the Progress in Development Studies. The list of nominated articles as well as the name of the winner is announces in the October issue of the journal. The winner is awarded a sum of $200 as cash prize. SAGE Publications and Madras School of Economics came together in 2007 to institute the SAGE-MSE Endowment Lectures, it is a series of annual lectures by eminent personalities in the field of Economics on topics of current interest. This is an attempt to take economics beyond the boundaries of academia and make current economic theory, policy and analyses available to an interested audience from various walks of life. Continuing this culture of taking economics to the common man, the SAGE-MSE has successfully conducted the lecture series for many years with eminent personalities participating.